Chances are pretty good that if you spot a solitary bird perched high on a telephone wire it will be a kestrel. You’ll be able to identify it even before you get a good look. The odds for early I.D. are improved if that wire is along a country road and almost guaranteed if they are situated in a weedy right of way. Oh, there are plenty of high wire birds out there during the winter. Mourning Doves, Starlings, and even overwintering bluebirds all will sit upon the highwire, but the key to this discussion is the word “solitary.” These other guys tend to flock together as birds of a feather. Kestrels are loners during the wintertime. 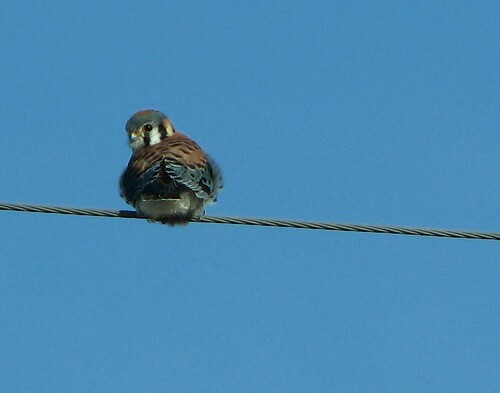 Kestrels make so much use of telephone lines as hunting perches that it is fair to say that these two entities are inseparable. They are rarely seen without them (although it doesn’t work the other way around – there are plenty of telephone poles without falcons attached to them). Although I can’t verify this, I’m fairly sure that this relationship stands true throughout the bird’s extensive range. 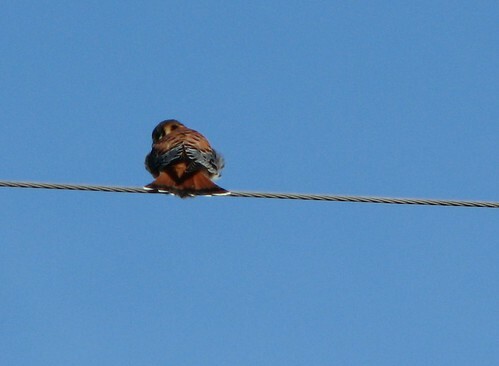 I came upon this high wire kestrel while on the way to Moscow, for instance. O.K., it was on the way to Moscow, Michigan, but my point is still valid. These birds can be found all the way from Alaska and northern Canada to the very southern tip of Chile. From the land where they are called Crecerelle d’Ameriques to the southern hemisphere where they are called Cernicalo Americanos, American Kestrals are creatures of lofty vision. I am admittedly ignorant of the number of telephone wires in Chile and the Northwest Territories, so I’d better qualify my remarks by saying this thought only applies in areas “where telephone lines are present.” Perhaps Llamas would do as substitute perches in South America. From a distance, removing the presence of the wire perch for a moment, the familiar outline of these robin-sized falcons is diagnostic enough (see above). They sit like tiny hunchbacks as they steadily scan the ground below for mice. Creatures of nervous habit, kestrels frequently bob their tails up and down when on the hunting perch. They betray their inner energy by tail bobbing in the fashion of a stalking cat twitching only the end of its tail. I counted the tail bobs of a wire-perched bird the other day and found that the individual flicked his tail no fewer than 72 times per minute. That’s more than once per second. This bird was aware of my presence and was likely showing a little more anxiety than usual. I do tend to elicit that same reaction in people as well. Up close, the birds present a dazzle of color to add to their familiar profile. Male birds, like the one pictured here, have rich blue-gray wing coverts and rufous tails. The females are heavily barred all over, even on their tails, and lack the blue-gray portions. All individuals have striking black facial marks – called mustaches on the males and well…, the same thing on females (I have seen old Italian women with mustaches, so there is some precedent for this). You know, now that I think of it, I probably make people nervous because I say things like I just stated. But, this isn’t about me, is it. It’s about Kestrels, so let’s get back to the subject at hand. During the winter months these colorful falcons concentrate on meadow voles (mice), shrews and a few small birds as target prey. Of these, however, the voles are at the center of the target. There is no better vole habitat on earth than the grassy areas found along those Kestrel infested power line right-of-ways. Kestrels are very good at nabbing voles. They drop down onto their selected prey, clutch it in their powerful little talons and return to the power line for a power lunch. This is not the only hunting method employed by the kestrel. They are expert hang gliders as well, but we’ll leave topic for another time. 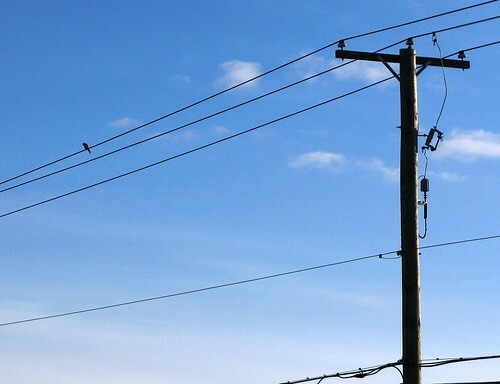 Whether by dropping down from a telephone line or a stationary aerial station, the birds descend upon the mice from above. You’d think that meadow voles would catch onto this scheme, but they don’t. They are content with the fact that Kestrels, like all predatory birds, miss a great majority of the time. I’m not sure why I found it funny, but I found this quote from an Ohio Journal of Science article published in 1982. The piece was talking about how meadow mice don’t look up that much. I quote: “Microtus (meadow voles) are usually under protective cover and don’t see aerial predators, and thus have not developed precise aerial predator detection capabilities.” These are sweet words of reality for a wire perched Kestrel. I realize that I frequently bring dead things to your attention quite a bit. Road-kills, hawk-kills, and owl-kills are potentially educational and I feel justified bringing them to your attention based upon the “it’s a shame to waste a dead thing” rule. Raccoons are not subject to this dictum, because they are worth wasting, but all other once-living things are game (or “gamey” as the case may be). At any rate, I try not to overdo it. It is a concerted effort on my part to pepper accounts of living and dead things equally through this blog. I do this also as part of an on-going effort to bring you in-focus pictures. You see, another little appreciated aspect of dead animals is that they tend not to move and are relatively easy to photograph. They stay in focus. A perfect case to illustrate the above point happened only yesterday. I almost hit a Red Fox as he dashed in front of me on LaSalle Road. The creature was going like a bat out of hell with his ears pinned behind his head. A large black dog was hot on his tail as the creature dashed across the yard to my right and flew over the width of the road in about .05 seconds. The dog broke off his chase at the roadside – having successfully cleared his master’s domain of vermin. The fox never looked back and melted into the scrub on the other side after a few more gallops. I stopped to reach for my camera but the event was over so quickly that I failed to get a shot off. If I had, the whole scene would have been a blur anyway– a streaking red-brown blur taken through a dirty windshield. The black dog was beaming with excitement and would have gladly posed for a portrait (no doubt requesting it to be entitled “Blackie – Slayer of Foxes.”) But, I didn’t want a dog shot. If I had hit the fox with my car, on the other hand, things would have been very different. The ensuing photos would have clearly shown Renard’s beautiful orange fur, black feet, and cat-like eyes and I could have waxed poetic on these features. I am doubly glad at having witnessed the event without hitting the fox, but this means that I have nothing more to say about this matter except: “the quick brown fox jumped over the lazy dog.” I am, instead, stuck with the subject of discussing dead and near-dead tadpoles. I’ve been holding back on this one but feel it’s time. Earlier in the season a deadly series of weather events combined forces to exact a heavy toll on some over-wintering bullfrog tadpoles. A west wind emptied most of the water out of our local Lake Erie marshes just as the temperatures plummeted. 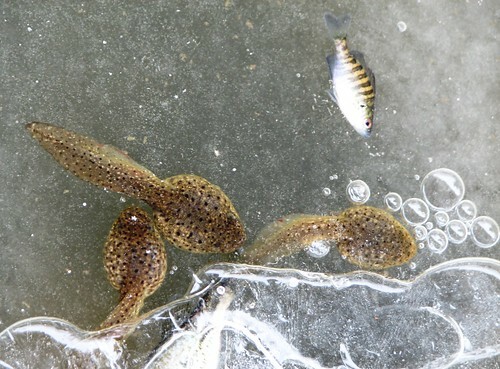 The water froze quickly into a solid block and locked dozens of tadpoles and young fish into a death grip (see here). 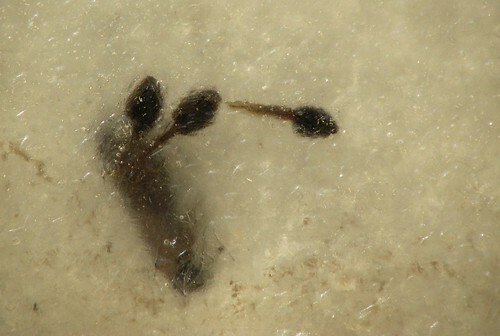 Many of the tadpoles appear to have been literally frozen in motion – their dead bodies caught in “life like” poses (see above and here). 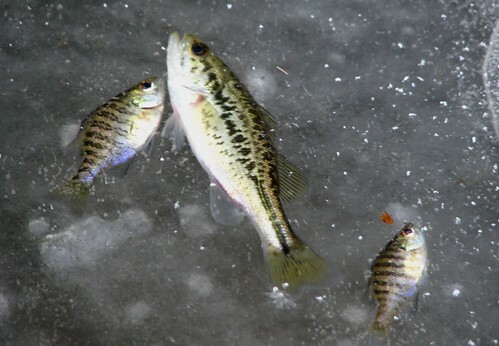 The dead fish, consisting of a large-mouth bass and a few sunfish, looked like glass-eyed frozen fish but they exhibited some nice coloring (see below). My photos in this case are in focus although they will not appear so because the subjects were encased in ice. My first reaction was that the pollywog kill was complete. It appeared that these unfortunate fellows had paid the price in the monopoly game called life. Under the ice, however, you could still see the slow-moving forms of living tadpoles just beneath the surface. There were individuals still hanging on. Over the course of the next few weeks, the ice thawed a bit. Meltwater and rising water created a new layer over the older ice cover. The remaining tadpoles were entering into this inter-ice zone from access holes through the older ice (see below). Their movements were highly restricted by the honeycombed environment of ice tunnels and labyrinths and many were getting trapped. Only those that kept moving maintained some kind of an open space around them. Bullfrogs always take at least one, and sometimes two years or more to complete their metamorphosis. This means over-wintering both as a tadpole and an adult. Most of the adult frogs stay put. They burrow into the bottom mud and hibernate. Thanks to elevated levels of glucose-based anti-freeze in their bodies, both adult and tadpole are immune to low temperatures. This immunity doesn’t extend down to the freezing level. Unlike some northern frogs, they are apparently freeze intolerant. Bullfrog sickles, in other words, will not come to life upon thawing. The tadpoles maintain an active winter existence as long as there is liquid water available. They may seek out deeper water in the summertime but invariably choose to inhabit shallow areas in the winter. This is probably due to the available sunlight and algae growth found in the shallows. Ice bound water also tends to become low in dissolved oxygen so it is doubly wise to seek open watery edges. Unfortunately, the tactic is a risky one as we can see by this year’s problems. I’m fairly sure that most of the later ice-trapped tadpoles will survive. They will wiggle their way around until re-gaining access to the lower depths. Like the swift brown fox earlier, enough will survive into the spring in order to carry on their way of life. Those that fail in this endeavor will stay trapped in eternal youth – perfectly focused at one stage of their life. I took another set of fox squirrel pictures last week because there wasn’t anything else to shoot. It was a beautiful bright winter day with nothing moving about. 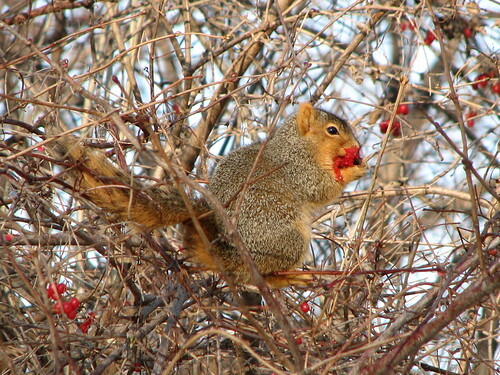 I came upon this plump creature feasting upon clumps of rich red Highbush Cranberry berries. It appeared as if he was enjoying every luscious bite although he wasn’t after the fruit itself. The blood red berry juice was dribbling down his paws as he plucked the seeds from each fruit in the cluster – discarding the rest. Below the cranberry bush the snow was covered with spattered red patches. It looked like the aftermath of some horrendous crime. Apart from the fact that it was a bit unusual to see a squirrel eating this vomitous tasting fruit, there was nothing unusual about this scene. It wasn’t a murder scene, it was only a sloppy feeding scene. The whole thing made for a cute shot, I’ll grant you, but I’m not sure the world needs another cute feeding squirrel picture. Squirrels are always eating and they are very often “cute” while doing it. So, you ask, why did I bother publishing this one? Frankly, the whole scene reminded me of something I recently read in the paper. I was looking over the Sunday edition of the outdoor page from the Detroit News. Granted, the paper was an older edition– Nov. 22, 1931 to be exact – so none of the news was topical. A story headline tucked into the center of the far left column caught my eye. “Fox Squirrel Kills Dog,” the large type declared. The sub-title explained “Farmer finds both animals dead: signs point to struggle.” Now, how could I ignore such a story? There was plenty on the page to compete with the squirrel article. It was located just above a fascinating piece about Beaver ranching (dam that was good) and a few columns over from another article titled “A Big Mouth but Valueless.” This last piece wasn’t about politicians, by the way, it was referring to Baleen Whales. Let’s see, there was another one about “How to Bag Lions in the Kalahari” which provided an exact set of instructions reading as follows: “First sift sand through a large sieve, when only the lions will remain. There you place them in a bag carried for that purpose.” No, you don’t read stuff like that in the modern papers. Wow, eh? You can see why my squirrel picture, eating what looked like a fresh piece of bloody dog meat (take another look here and here), reminded me of this dramatic incident. There were a few things about the story that needed some verification, however. Take the size differential between the squirrel and dog, for instance. Fox Squirrels average between 1 – 2 pounds in weight and middle sized rat terriers tend to be in the 6-8 pound range. That terrier should have easily handled that squirrel. They are ferocious little dogs. There is a record of a single rat terrier once killing 2,501 rats within a seven hour period. One squirrel should have only taken a few seconds to handle. To be honest, however, the piece never actually mentioned the exact type of rat terrier or the exact meaning of “very large” when referencing the squirrel. Given the fact that so-called Toy Rat Terriers can weigh as little as 4 pounds and that the squirrel might have ingested steroids at some point, the differential is potentially reduced. Also, do you remember the man-killing rabbit in Monty Python’s “Search for the Holy Grail” movie? I’m sure that bunny wasn’t much more than a few pounds in weight. That bunny went for the throat just like the Fox Squirrel in this story, so the plausibility factor is improved for the Oregon story. The only final hurdle, and it was a big one, was placing a Fox Squirrel in Portland Oregon. This species is not naturally found west of the Great Plains. I thought that perhaps the squirrel in the story was simply misidentified, but found that scenario unlikely. There are four native Oregonian squirrels, but all are pipsqueaks when compared to a healthy steroid ridden Fox Squirrel. I don’t think that even a furious western flying squirrel could kill a terrier even if the dog was unconscious! No, this fact appeared to present a fault line threatening to break open the whole storyline. But, not to worry. I found out that Fox Squirrels were imported to various locations along the west coast many years ago. One of the locations where these relocated animals survived is, you guessed it, the Portland, Oregon area! The story was probably true. It was a clear case of a mad immigrant squirrel taking on a native rodent killer. Once again I can believe everything I read in the paper (although I still have trouble with the lion catching thing). Why’d the Chicken Hawk Cross the Road? The title of this entry pretty much explains my initial reaction upon seeing an immature Cooper’s Hawk standing in the middle of the road. The bird stoically stood her “ground” as I approached. This was no silent approach on my part, mind you, I was in my big gray (actually gray-brown due to the thick layer of winter dirt) Chevy Blazer. The unusual sight slowed me down to a crawl as I scrambled to grab my camera. I needn’t have been so cautious because the creature stayed in place long after I’d positioned myself to lean out the window and snap away. In fact, she stayed put for a good long minute until another car came along from the opposite direction. Even then, in the face of a big red-brown F-250 pickup, she reluctantly flew up into the surrounding brush at the last minute. This same bird was in the same place when I passed by the same spot ½ hour later! I slammed on my brakes the second time and slid for ten feet. The bird watched me complete this graceful maneuver before taking a leisurely flight to a nearby limb. Here she perched and glared (see below) until the gray brown vehicle moved on. Later in the day, several other folks commented that they too had seen this crazy thing in the road. At the time, I could not answer the “why” questions that followed. 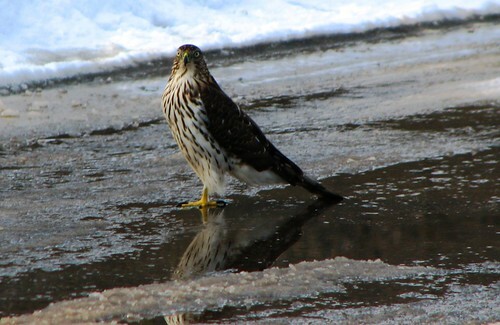 Cooper’s Hawks are not rare, so my attention in this matter can’t be categorized into the “rare-sighting” column. In mid-winter these birds are a very common sight due to the fact that they seek out neighborhood bird feeders to feed on the patrons. They are “bird hawks”; specialized in the art of taking small-medium sized birds. Most feeder owners are very familiar with this species and their reactions run the gamut from hate to acceptance to sheer excitement. Love ‘em or hate ‘em, however, they are used to ‘em. These predators are masters of patience who spend a lot of time doing absolutely nothing. More often than not they adopt a bolt upright pose and perch in plain sight. They will stay in position for so long that the feeder birds, endowed with frightfully short term attention spans, eventually return to their banquet. Soon one of them becomes the main course when the hawk launches into a swift attack upon the feeder. Another tactic employed by these slender hawks is to approach a potential target area by flying in low to the ground using some sort of obstacle, such as a house, as cover and then lunging over the top and down onto their startled quarry. Somehow Mourning Doves are always the last to react to such an attack (“What the heck…hey, where is everyone go..”) and so become the entree. In the above circumstances, the hunter appears only as a deadly blur in the last few seconds of the attack. At first I believed that my road hawk had just nabbed a dove and was in the process of plucking it. There was no prey in view either under or near, however. My bird was not in blurry hunting mode and so was clear in every detail. In fact, based on the swollen appearance of her crop, it was obvious that she had recently eaten. The bulge had a faint dove look to it. 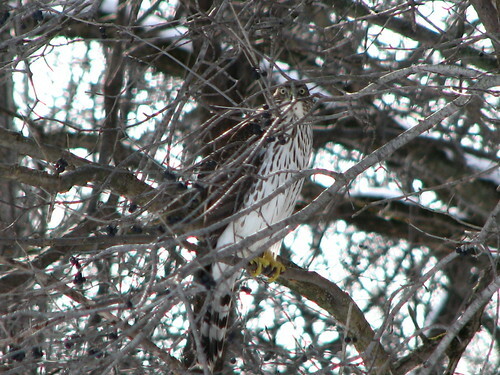 At the very least this provided a good opportunity to see the identifying details of an immature Cooper’s Hawk. The size and proportion of the J-walker marked her as a female. Sharp-shinned hawks, even the larger females, are smaller and more delicate in appearance than the female Coopers. Coops possess thick powerful feet and long tails which are rounded at the tip (Sharpies have slender legs and squared tail tips). Mature Coopers have ruby red eyes and stern expressions accentuated by a dark cap, while the immatures have piercing yellow eyes. Mature birds have a slatey gray back (similar to a dirty gray brown Chevy, as a matter of fact) and a reddish brown breast with horizontal streaking. Immatures have a white breast marked with brown vertically oriented streaks. So, alright, the question remains as to why this Chicken Hawk was in the road? Apart from the singular possibility that it was a young stupid fowl with a death wish there must have been something drawing there. There was also the possibility that I was witnessing a living, soon to be dead, punch line – you know the one about the chicken crossing the road to get to the other side. Encumbered by the need to elicit humor, my correct answer took longer than it should have to come to the surface. You’ll note that every shot I took had a nice mirror reflection in it (see images here and above) because the bird was always standing in a pool of shallow melt water. She was attempting to take a bath in the only liquid water available at the time. The continual traffic was interrupting her cleansing efforts. Hawks don’t need much water for bathing. They seem to prefer shallow puddles, under 1 ½ inches deep, in which to perform the duty. These hawks are especially prone to bathing in backyard bird baths. 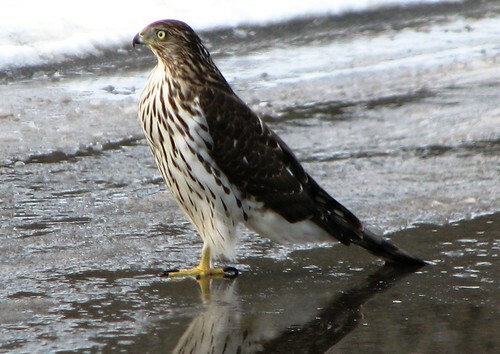 If you don’t believe me, just Google the words “Cooper’s Hawk, Bathing” and you’ll be treated to dozens of on-line videos showing this very thing. Oddly enough every one of these bathing beauty videos appears to depict an immature bird, which begs another question that shall remain un-answered for now. There were no videos of any mature birds in the bathing process (perhaps someone out there might investigate this). Also, as far as I could tell, no one has a video of a road bathing bird either, but then again, neither do I.
I yelled “Ah Ha!” rather loudly upon discovering that I had succeeded in my mission. For the past several months, an opossum was conducting nocturnal forays into our eagle enclosure to feast on scraps. He was just small enough to squeeze through the slats and was coming and going with apparent impunity. 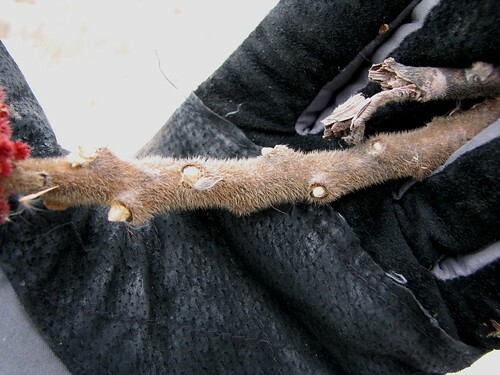 In fact, the sheer abundance of track evidence suggested a bit of arrogance on the part of the thieving marsupial. “Catch me if you can” was the implied challenge. I brought this subject up in a recent “Naturespeak” and I ended that piece by saying that this ‘possum would soon suffer eviction. Fortunately I was eventually able to secure a live trap (see here) and make good on my promise. It was too easy, really. Baited with a nice fresh fish fillet, the trap was set out in the late afternoon of one day and it contained the guilty party upon the dawning of the next (see here). My “ah ha” moment resulted from a visceral sense of victory of one man over a mammal with a brain the size of a hazelnut. You take victories as they come. In the back of my mind I was hoping for a long-lasting duel in which the trapper and the trapped pitted their wits against each other over an extended period of time. You know, like those legendary tales of western trappers trying to nab a wily sheep-killing wolf named “Old Snag” that had eluded capture for a decade. A trapper named “Slim” arrives and gets the job done, but only after losing his trusty beagle “Teddie” in the final struggle. No, I simply set the trap and I got the critter and that was about it. The fish died, but he was dead already. Unlike “Slim”, I was using a live trap. The idea was to capture the beast and kick him out of town. 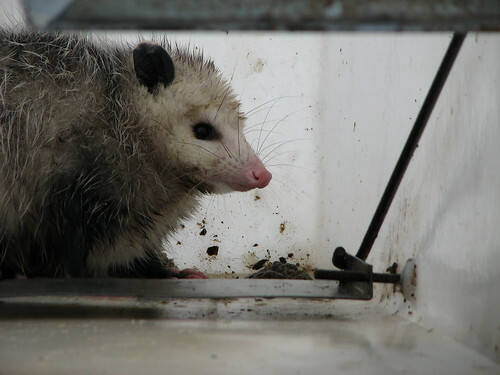 Huddled inside the confines of the trap, the opossum looked very repentant. These marsupials always look guilty, even when they are innocent of ill deeds, but this one looked especially so. Just like his track evidence had indicated, he was a small guilty party. ‘Possums can get to be house cat size, which means anywhere from 4 – 14 pounds, but my captive was only 2 lbs, if that. He avoided all eye contact and made no effort to protest his capture. And, surprisingly, did not play ‘possum even when jumbled around. 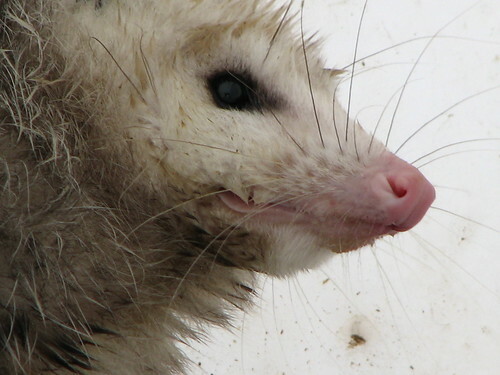 There are a lot of fallacies surrounding opossums, especially relating to their mating techniques, but the one basic truth revolves around their famous ability to feign death. They can indeed lapse into a catatonic state at times of high stress. At such times they will curl up their lips and bare their teeth, salivate heavily, and enter into a limp non-responsive state (Oddly enough, this mysterious nervous collapse doesn’t result in any metabolic change or decrease of heart rate). I’ve only seen this act once and found it to be quite convincing. It may last for a few minutes or a few hours. The problem is that the poor critters have no control over this reaction. They do not, and cannot, consciously slip into unconsciousness, it just happens. I took my opossum for a ride, briefly entertaining the thought of releasing him in the middle of I-75. Instead, I took him to a nice wild place far from caged eagles. I took him to a place where free-flying eagles eat small mammals. Before releasing him I shook up the container a bit to see if I could elicit one of the above named responses, but the thing remained silent, wide-eyed, and stoic. No amount of verbal abuse could get him to react in any other way than to sit there – frozen in position – with a silly grin on his face. In fact, even when the door was propped open he refused to budge or flee. I actually had to tip the trap on end in order to deposit him on freedom’s ground. Even when fully liberated, however, he was less than able to take advantage of the situation. He stood there like, as Ernie Harwell used to say, “like the house by the side of the road…” (see here). Instead of playing ‘possum he played statue with me. He would launch into a slow retreat only when I moved and then freeze into a pose when I stopped moving. I moved, he moved. I stopped, he stopped. At one point he stopped in mid step with his fore-leg in a raised position and he slowly, oh so slowly, let it drop down to complete the step. You can watch a short bit of this game on this video sequence Eventually the creature managed some form of escape when he ducked into some thick brush and disappeared from view. I would like to add this “Statue of Liberty” act to the list of opossumisms. I must say it sure beats all those other conscience defense tactics. Oh, by the way, if he shows up in the eagle enclosure again, I can guarantee that he will achieve a very realistic death pose. The Black-capped Chickadee is a bird in constant motion. Even on the chilliest of winter mornings, when all other creatures are huddled into motionless balls of fur or feather, this little dynamo is on the move. A day without that high-toned chickadee chatter cutting through the frosty air is a rarity. As a nature chronicler, it is one bird you can count on to provide a living subject for your eye and camera when nothing else is out and about. They actually come to you rather than you to them. Unfortunately, this dynamism also makes them a hard subject to “catch” photographically. Just about the time your auto-focus keys in, the thing shifts position and flits away before the shutter is actually triggered. You are left with some well focused twig pictures. A few weeks ago, I was accosted by a gang of neighborhood chickadees while walking one of the trails at Kensington Metropark. The day was snowy and silent and , true to form, these were the only warm-blooded life-form around. This population is probably one of the most photographed populations in S.E. Michigan because they are accustomed to hand feeding by park visitors. Although it is against policy, and rightly so, it is obvious that folks still do this. The birds come out of nowhere and circle your head as you walk – chattering like street vendors. If you hold out your open hand they will land on it (expecting a feed). This is not natural. Natural or not, I decided to attempt an impromptu and in-focus chickadee picture. I held out my hand and focused on my fingertips. Before I could properly react, however, one of the birds alighted, instantly perceived that I had nothing to give, then turned and flew off. I got a great picture of my gloved hand – every weave detail and textural intricacy of my glove was captured. The birds vanished once my ruse was detected and I was left to take pictures of the Tamarack trees. Trees don’t move much on a still cold day. I finally captured a fully fluffed chickadee image a few days ago (see larger pictures here and here). The bird was engaged in picking at a sumac seed head. It landed, delivered a few blows at a seed, and moved on. I happened to be there with my focus and managed to get two shots off. Well, I actually took three shots but there’s no need to show you the naked twig picture. In short, the chickadee is not an easy bird to freeze into a picture image. But, my point here is not a photographic one. The thing I wish to drive home is that the Chickadee is a hard bird to freeze – period. These tiny birds are masters of thermogenesis: staying warm. The most obvious Chickidian warmth tactic is apparent in these pictures. You’ll note that the bird is puffed out like a gray pom-pom. The dead air space created by the raised feathers traps and conserves precious body heat. Nearly all birds do this. What is not obvious is that the bird is producing that heat by being active – something called “activity thermogenesis.” This is why they never sit still. There are two ways to make heat, one is through muscle shivering and the other is by movement and activity. 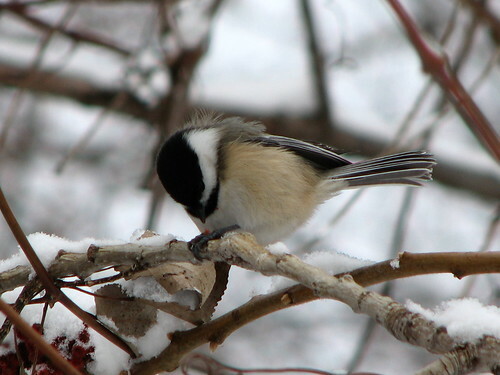 Chickadees carry around very little fat, so can’t get much “burn” out of shivering. Instead they resort to activity thermogenesis which means they generate heat by continually moving. 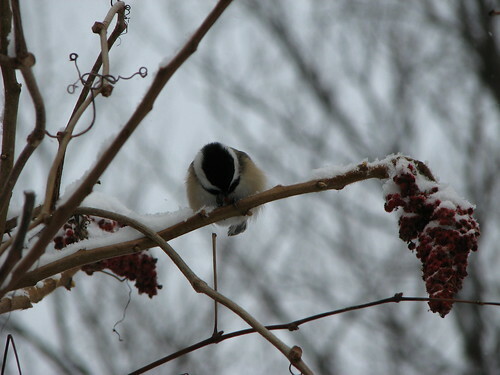 This method requires a lot of food, and chickadees spend over half of their waking hours looking for it, but it also saves energy for those long frigid nights. You could say that a chickadee at rest during the day will end up staying at rest – forever. They’d freeze into an easily photographed still life! A chickadee at rest during the night is a different story, however. When these birds stop for the evening they really stop. Remarkably, they are able to enter into a controlled state of hypothermia and are able to let their body temperatures drop well below the “safe” level. Every once and a while they engage in short bursts of shivering to keep up appearances until the morning sun prompts them back into action. So, it appears that Chickadees do make themselves available for portrait shooting; it’s just that their particular sitting period is during the dark of a winter night. There’s nothing dishonest about Fox Squirrels. They don’t bother trying to be suave or sophisticated, because they are not. They are nimble, yes. Adaptable, you bet. Free from anxiety, no. At times it seems that everything on the planet is out to smite them. Predators, disease, Hondas, hunters, accidents, weather, and at least 34 other things are listed as potential sources of death in the squirrel survival book. Unfortunately, they can’t read. So, instead of restricting their avoidance tactics to the listed “dangerous things,” they simply distrust everything -thus the high anxiety level. The only thing which overrides this general distrust is the desire to eat and the drive to make little squirrels. In these categories they are quite upfront. “Eat, live hardy, fear everything, and die before you need a walker” could well be the Fox Squirrel motto. It’s a long motto to be sure. Personally, I believe the Klingon mantra “this is a good day to die” would be easier to say when a car is bearing down upon you. Let’s not get the wrong idea about squirrels, however. Even though they are resigned to death, they do not embrace it until it embraces them. They employ all their nimble and adaptable powers to avoid it. If they end up looking awkward while skirting the issue of squirrelius mortemus , so what. It’s better to be silly than be supper (hey, that could be another motto). I offer up two squirrel related incidences which, if they don’t prove my point, at least go a long way toward hinting at it. They involve two situations in which the squirrel was being, well, a squirrel. Both are unremarkable, but telling. 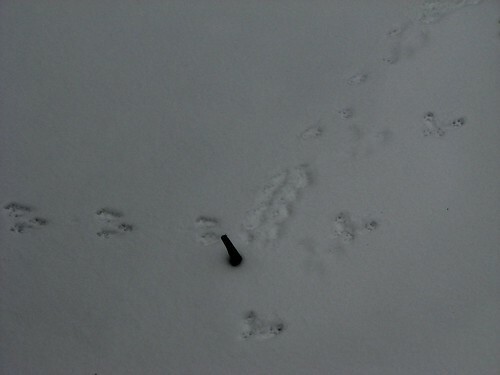 First up is a Fox Squirrel track pattern in the snow which exhibits a moment of great anxiety concerning a stick. 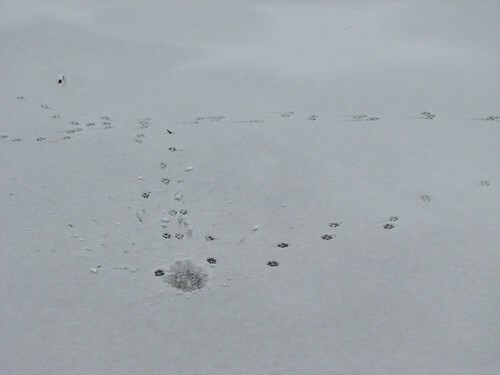 This track (see below) was laid onto a layer of snow where a neighborhood squirrel regularly crosses over a frozen canal. Several sticks were poking up through the ice and one of them stood about 6 inches over the surface – its blackness standing in stark contrast to the surrounding whiteness. Although it appears that this particular squirrel passes this stick multiple times over the course of a given week, the thing suddenly became ominous one day. The track pattern says it all. Take a good look at this picture and you’ll see that the squirrel approached the danger stick from the right. Starting off with the typical lopping gait, the nervous creature stopped about four feet away and proceeded at a slow walk toward the mystery object. 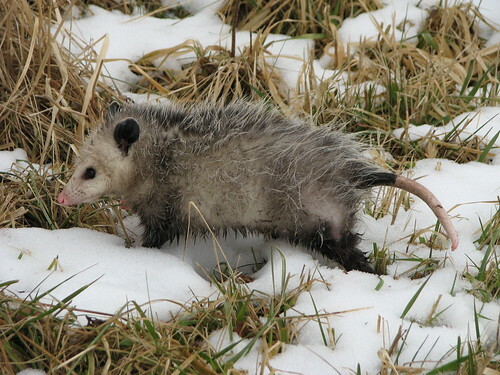 The walking pattern is similar to that made by opossums and raccoons where the front and hind foot marks are paired. You can imagine the animal advancing step by step with its head rocking back and forth – like those apes approaching the monolith in 2001: A Space Odyssey. The funniest thing about this pattern is where our squirrel resorts to a series of bottom shuffles in order to cover the last 12 inches before making contact. At the end of this genuflection walk, the squirrel probably touched the “monolith,” mentally noted that it was just a stick, then galloped off to find another way to die. What was this squirrel thinking? Who knows? If that stick had turned out to be a venomous snake then…better silly than supper. 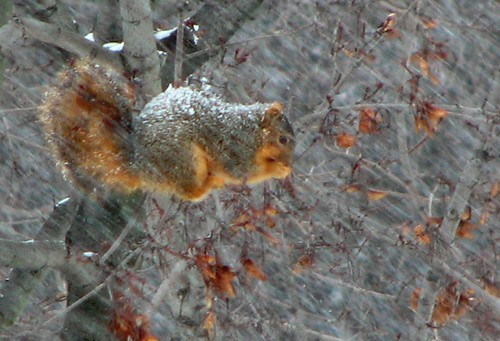 Last week we experienced the first big snow of the season and this provided an opportunity for my second squirrel observation. The storm hit about mid-day. Most critters seek shelter in such a situation and wait until it passes. 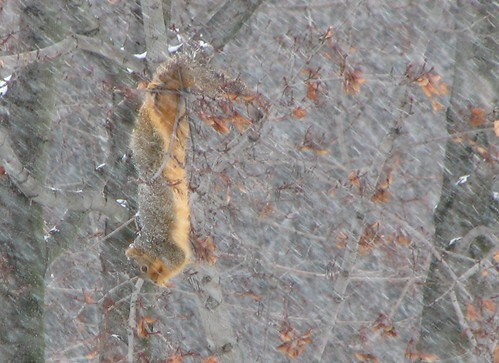 I spied a chunky Fox Squirrel defying the elements as he engaged in maple seed harvesting (see photo below and here) while the storm was hitting at full intensity. Her tree, a Norway maple, is normally reserved as a winter food source by the regional squirrels. The seeds have dangled in position since late summer, but for some reason this Fox Squirrel decided that this storm signaled the start of the harvest season. In this case, I am not accusing the squirrel of silliness. In hindsight, I believe she knew that the storm would end up laying down a heavy layer of snow. Perhaps she sensed that food would be harder to get in the near future and was exhibiting, in fact, some sort of weather prognostication. I am also marveling at her plucky exhibit of dexterity. There are very few creatures that can eat while hanging upside down by the smallest of toe-holds. Chickadees do it all the time, but they only weight a few ounces. Fox Squirrels, on the other hand, weight around the 1.5 pound range. This one was cheating death by facing it head on. To this squirrel, and to all squirrels, I tip my hat to your pure squirreliness. Some animal/plant names evoke word associations that are joined at the hip. For instance, it is near impossible to say “mammoth” without automatically saying “woolly mammoth” or “gull” without forging the word “sea” onto it. In truth, not all mammoths were of the woolly type and there are no birds actually called seagulls. It’s an easy verbal habit to slip into and a hard one to break. This laxity is not criminal, but it does tend to deny the wonderful concept of diversity. There have always been multiple models, or species, of every life form on earth. This concept is what makes life interesting. For instance, in our neck of the Ice Age world, Jefferson Mammoths (not to be confused with Jefferson Airplanes) ruled the plains. These elephantine beasts were probably not all that hairy. Wooly Mammoths were the hairy ones. They were the ones who roamed the northern tundra, leaving their fuzzy frozen carcasses for us to examine. There are dozens of gull species (herring, ring-billed, ivory, etc.) and not one of them is technically a seagull. If you consider the actuality that seagulls are gulls living near the sea, then these same birds could also be called lakegulls, pondgulls, McDonaldgulls, and bagels depending on where they were at any given time. Come to think of it, a flying gull could become all of the above over the course of a single flight. That same gull, however, would remain a Herring Gull no matter how far it flew or what landscape feature it happened to go near. Hopefully you see my point – there’s no use beating a long dead elephant here. I bring this topic up because I once was guilty of automatically labeling all sumacs as Staghorn Sumacs. Now that I have confessed to this misdeed, I must do penance and explain that there are actually dozens of sumac species, but only two of them are common in southern Michigan. These are the pair which I had previously lumped into one. One of them is a Staghorn and the other is not. 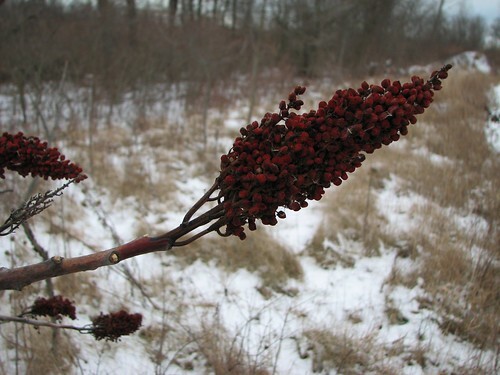 The other species is called the Smooth Sumac. Fortunately, sumacs are easily identified in the wintertime. These spindly medium sized shrubs grow in small clusters along woodlot edges or in scrub lots. The naked winter stems exhibit distinctive red berry clusters that look like fuzzy candelabras. Beyond the commonalities between them, the key to separating the Staghorn and Smooth type is similar to telling the difference between the Jefferson Mammoth and the Wooly Mammoth – it’s in the fur. Staghorns have fuzzy stems and berry clusters and Smooths, true to their name, have smooth stems and berries. Staghorn Sumac stems look almost mammalian in their density of light brown “hairs” (see above ). This feature, because it resembles a stag – or deer antler- in velvet, is responsible for the common name. Of course, this growth is not really fur but the resemblance is remarkable. Note also that the berry clusters are fuzzy as well (see beginning photo and here). So, Staghorns are the Woolly Mammoths of the plant world. Smooth Sumac stems are relatively hairless (see above) and represent, in my forced effort at comparison, the Jefferson Mammoths. Their berry clusters are also red, but hairless (see below). These two species separate themselves in other ways. Habitatwise, Smooth Sumacs prefer dry upland soils and the Staghorns seek wetter soils. 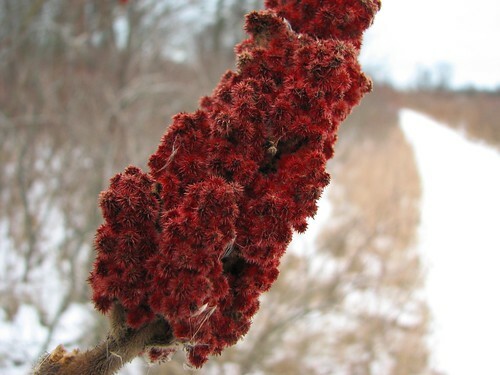 In a continental view, the Smooth Sumac is found all over the United States. One reference even states that it is the only American shrub native to all the 48 contiguous states. The Staghorn, on the other hand, restricts itself to the N.E. states. Now that I’ve taken great pains to separate these two plants, I must conclude by saying that our ancestors made no such effort. Native Americans have long combined the leaves and bark of this shrub with tobacco for smoking purposes. Natives and settlers alike have used the tannin rich components as a dye material for cloth. Depending on what part is used, a black, red, or tan color can be produced. 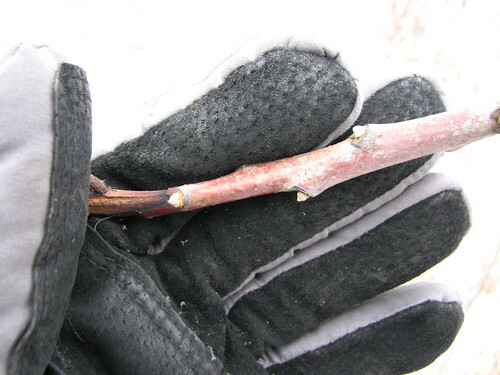 The hollow stems were also used as maple syrup spiles. There was no differentiation as to species. Knowing this, you can now put this information in your pipe and smoke it, put it in your pants and wear it, or put it in your mind and remember it. This has not been a snowy winter so far in S.E. Michigan. Although it has been cold, little of the white stuff has covered the ground in my neighborhood here in the extreme S.E. portion of the state. The rest of the peninsula has seen plenty and I’m more than a bit jealous. I happen to like snow. No, I don’t love shoveling it or driving on it, but the stuff more than makes up for these negatives by creating some of the prettiest landscapes you’ll ever see. Snow can make a junk car look poetic or turn a windblown roadside ditch into a sculpture gallery. As a naturalist, I also appreciate it as a track medium. A fresh layer of snow, like a new sheet of paper, is a clean palette ripe for natural story-telling. The last dusting revealed the wanderings of a coyote through the pre-dawn landscape along the Erie shore (see above). These wild dogs have expanded into nearly every human and wild neighborhood in the country. They have made it a habit to stay out of sight, however, so you rarely see them in the light of day. Especially in the east, they tend to restrict their activities to the dusk and dawn hours when human folk aren’t as likely to shoot them – or at least hit them when they do. 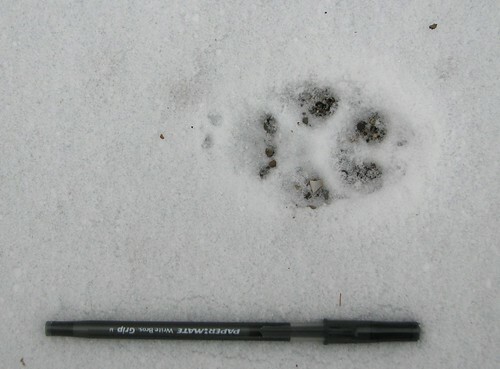 The alert naturalist will note their fresh tracks along nearly every backwoods or field trail after a snowfall. These wild dogs are on the move throughout the year, but only a good snow cover can record the true extent of these wanderings. Typically, an individual animal maintains a regular route which covers their sizable home range – an area that can extend 30 square miles or more (Coyotes living in prime habitat can afford to maintain a much smaller home range). They are looking for food such as rabbits, carrion, and mice, and stopping to mark the borders by scent marking. Like mall security guards, they walk the beat and check the perimeter doors and food vendors. Unlike Mall cops, they fit neatly into their uniforms and can run for great distances. If you chose to follow one of these coyote tracks, be prepared to go a long way. Make sure you are tracking the right beast before attempting this. The tracks are very dog-like but can be distinguished from our familiar house mates by their proportions and pattern. 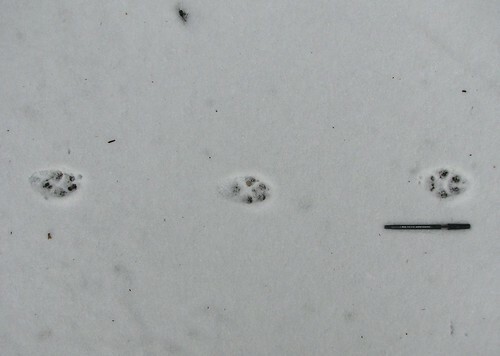 Dog tracks tend to be round in outline whereas the coyote footprint tends to be oval in outline. Red Fox tracks are also similar but they show little in the way of a heel or toe pad and are generally much smaller. An individual coyote track is usually in the 2 ¼ in. – 2 ½ in. range. I say “usually” because these animals vary in size and large individuals can top the scales at 40 pounds or more. A bigger critter will leave a bigger track. Regardless the actual size, the front foot impression is always larger than the hind foot mark. The track -shown below- measures about 2 ½ in. from the back of the heel pad to the tip of the center toe pad. I assume it’s a front foot mark. Coyotes habitually use and drop Papermate pens along their routes, so this was another valuable identity clue (a 6 inch pen also helps to provide a scale for the photo). When on the move, a coyote will lay down tracks in a straight line. Dogs tend to veer all over the place and cluster around human foot prints or in back yards! For the most part, you will encounter mile after mile of determination when trailing a coyote. They rarely veer from their course unless alerted to a point of interest. The only path deviation I encountered during my recent attempt at coyote tracking was a situation (see below) where the animal took a right turn to look at a disturbance on the ice. Apparently a clump of snow from an overhead tree, or a snowball, made an impact mark on the virgin surface. The coyote turned, probably with nose to the surface, to investigate but quickly dismissed the mark as being unproductive. It didn’t even break stride as it turned back to its original direction. Unfortunately, during my short attempt at long-term tracking, amounting to less than ½ mile of ground and ice, I didn’t uncover any dramatic signs of predation or even locations where the coyote sprinkled down some scent marking urine. My reward was the opportunity to replicate a small part in the life of a coyote that I never met. I’m confident that someday our paths will cross again – and soon.